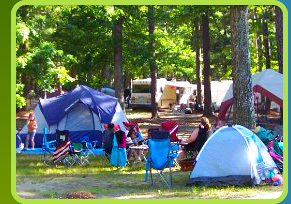 Egg Harbor Lake Campground is located at Egg Harbor City Lake Park and is under new management. If you want to swim, camp, canoe, fish, golf or just relax then you are at the right place. Enjoy the peaceful settings of the New Jersey Pine Barrens or head out to the fine restaurants, stores, shopping, recreation or the Atlantic City nightlife! All of which are just a short drive from the campground. Below is a list of some of the nearby attractions. A little history of Egg Harbor City: Rich in local history, Egg Harbor City is also a jumping-off point for nearby Atlantic City (just 18 miles away) as well as for a number of Atlantic County historical attractions and entertainment opportunities. In the mid 1800s, Egg Harbor City was a magnet for Germans living in the Baltimore area. They moved here en masse and infused an Old World feel into their New World home. The Historical Society’s Roundhouse Museum: has displays that cover the city’s Teutonic history, its time as a health sanitarium (the Roundhouse once belonged to a Dr. Smith, who touted the town’s therapeutic waters). There's also glassworks displays and information on the town’s oenophile background (there were 96, mostly mom and pop, wineries located here at the turn of the century!). Storybook Land: For over 50 years, Storybook Land has been keeping the spirit of childhood alive in an entertaining and educational atmosphere. We invite you to relive your childhood while introducing the innocent themes of wonderment to an entire new generation. Your children’s – and grandchildren’s – memories will be with them throughout their lifetimes! The timelessness of childhood will ring true as your family literally walks through its all-time favorite stories and nursery rhymes at Storybook Land. Children’s classics are interspersed with exciting new family rides and attractions in a remarkably clean and enjoyable park setting. Join us several times a year for memorable family experiences. You are certain to enjoy your visits! Renault Winery: Renault Winery Resort & Golf offers a unique experience with their award winning restaurants, winery and their 18 hole, 7200 yard championship golf course. Public play is welcome as are yearly memberships. Be sure to take a Renault Winery Tour - where they feature their celebrated Antique Glass Museum, a sun-drenched European Courtyard, a private collection of Antique Winemaking Equipment, the Pressing Room and more. Historic Smithville & Village Greene: The Historic Smithville & Village Greene is a wonderful place to visit with its more than 60 shops and restaurants in late 18th century buildings arranged along cobble-stone streets and boardwalks. From shops specializing in British, Irish and Italian imports to gift shops filled with lace, collectables, Christmas ornaments and hand-made glass art, this little village is visited year round by anyone interested in browsing for or buying the unusual and one-of-a-kind. Edwin B. Forsythe National Wildlife Refuge: The Edwin B. Forsythe National Wildlife Refuge, where more than 47,000 acres of southern New Jersey coastal habitats are actively protected and managed for migratory birds. The Refuge provides outstanding opportunities for compatible wildlife-dependent recreational activities involving hunting, fishing, wildlife observation and photography, and environmental education and interpretation. Dining and Entertainment in Atlantic City: If you are looking for dining and entertainment then Atlantic City has it all. Casinos/Gaming, restaurants to serve all tastes, active nightlife with Blues/Jazz, Country/Western, Rock & Rock, along with show bands and a family friendly choice of activities are only minutes away. Batsto Village: Batsto Village, is a New Jersey historic site located in the South Central Pinelands, which is administered by the New Jersey Department of Environmental Protection's Division of Parks & Forestry. This site is nationally recognized for its historical significance and beauty. The roots of Batsto Village can be traced back to 1766. 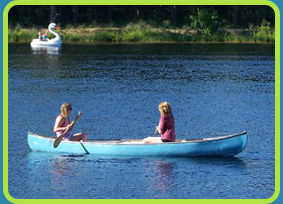 Two centuries of American history are available to visitors, with the Pinelands environment as a scenic backdrop. Tours are available for the village and the mansion. Pine Barrens Byway: The Pine Barrens Byway was designated as a New Jersey Scenic Byway in 2005. The 130-mile route extends from Batsto and Tuckerton in the north to Dennisville and Port Elizabeth in the south, passing through five counties and 16 municipalities. Along the route are two National Wildlife Refuges, ten State Wildlife Management Areas, three State Forests, five County parks, several major rivers and numerous smaller streams, as well as a variety of historic and scenic sites. Estell Manor Park: Estell Manor Park is bordered by the Great Egg Harbor River / South River to the east and by Route 50 to the west. In all, it is about 1700 acres large. This is Atlantic County Park System's most popular park and the Division of Parks and Recreation headquarters. After the Native Americans, this was land owned by the Estell family and was the site of a glassworks in the 1800's, then became the site of a munitions plant during World War I. After 70 years, the forest has reclaimed this area, and is now home to an incredible diversity of plants and animals. Ocean City: Ocean City, New Jersey is one of the country’s finest year-round resort islands with eight miles of beautiful beaches and bay for sunbathing, boating, fishing, jet skis and kayaking; 2.5 miles of boardwalk complete with two amusement parks, water park, go-carts, bike rentals and miniature golf; fine dining restaurants and a downtown shopping district with many unique specialty shops and stores. WheatonArts: WheatonArts is a not-for-profit arts organization and a leading resource of American craft with an emphasis on the medium of glass, a stronghold in New Jersey's cultural history. Programs include museum and gallery exhibits; interpretive demonstrations in various craft mediums; an artist fellowship program; outreach and on-site school programs; and collector's seminars. All serve to educate a multi-level audience on the role of the crafts in both traditional and contemporary life. Hamilton Mall: Hamilton Mall in Atlantic City, New Jersey is the place to be for great shopping, mouth-watering cuisine and good times. Hamilton Mall, NJ is located just outside the city in Mays Landing and features over 140 specialty stores, restaurants and an international food court. Visitors will find department stores such as JC Penny's, Sears and Macy's in Hamilton Mall, NJ as well as a variety of other stores. Hamilton Mall, New Jersey is home to over a hundred specialty stores that offer everything from children, men's and women's apparel, to books, beauty supplies, accessories, home products, entertainment items and specialty products. There are also a number of restaurants, including Olive Garden, Red Lobster, Ruby Tuesdays and fast food venues offering a variety of different cuisines and snacks. Atlantic City Boardwalk: Atlantic City Boardwalk provides shoppers a unique experience with local finds such as salt water taffy and delicious fudge to Atlantic City-themed souvenirs and gifts. The Pier Shops at Caesars offer world-class shopping, dining and entertainment with approximately 90 high-end shops and restaurants, boasting such luxury names as Gucci and Louis Vuitton. Casino gift shops are easily accessible from the Boardwalk as well. New Jersey Golf Courses: A comprehensive list of golf courses in the Egg Harbor City Lake, New Jersey area can be found at this link. They list them by proximity to Pomona, including courses in neighboring cities. Award-winning golf courses are noted. 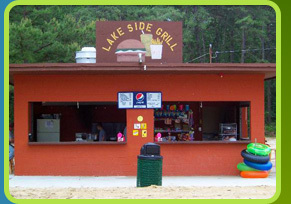 © Egg Harbor Lake Campground. All rights reserved.